You had one trip to the salad bar. So dammit, you had to make it count. In China, Pizza Huts are either take-out only or somewhat upscale sit-down restaurants that even serve steak. 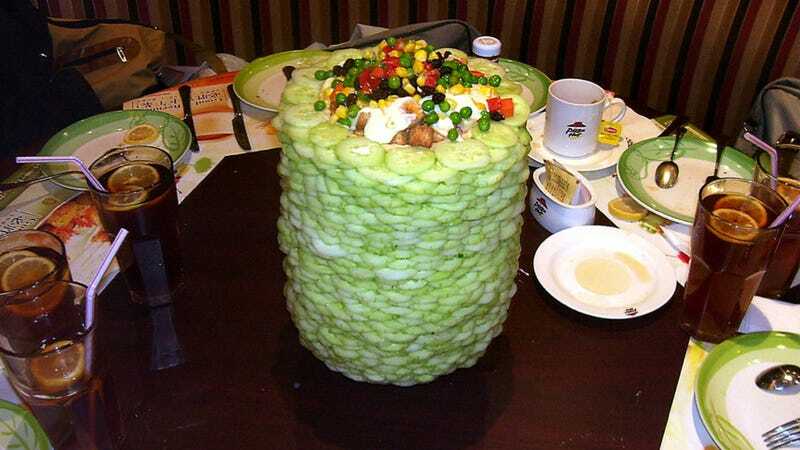 A while back, it became a fad of sorts to build enormous fruit and vegetable structures at Pizza Hut salad bars. The reason was that customers only got one plate and one trip to the salad bar, so they wanted their visit to be worth it. And was it ever. There's an art and a craft to good salad stacking that, like with real structural engineering, needs good foundations to build higher and higher. Here, that strength comes from carrots, cucumbers, and croutons. As The Beijinger first reported in 2009, Pizza Hut actually announced it was removing salad bars from its restaurants as part of a menu revamp. It was believed that salad stacking was to blame. Ya think? However, according to the Baidu wiki, when Pizza Hut announced it was removing the salad bars, that apparently encouraged people to make salad towers before the salad bars were gone for good! Others in China agreed with Pizza Hut's decision because they felt these food structures were wasteful if people didn't finish eating them. It's unclear whether Pizza Hut was actually able to remove salad bars from all its restaurants in China. Kotaku's Beijing based writer Eric Jou says there are still salad bars in a Pizza Hut near him. Sadly though, there are no salad towers.